Member of Parliament Suresh Angadi who held a review meeting on the progress of the Railway over bridge at Gogte Circle, set a deadline of March 2018 (six months) and December 15, 2017 for the Old Dharwad road RoB. 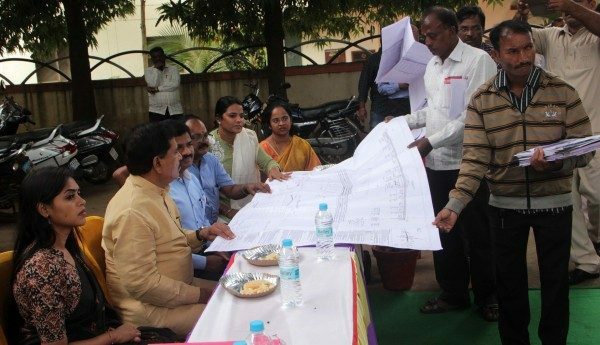 At the review meeting in which all the departments were called, he said that the new RoB would be 60 feet and once open will solve all the traffic problems of the citizens. He urged the PWD to cut the trees and make way for work to start. BSNL was also told to relay its cables, about 5000 BSNL landlines are dead since the work began. The Gogte circle RoB will also have pedestrian pathways on both sides. Four families that have encroached upon Govt land near the RoB would be evicted. There were suggestions that the entry to the RoB be from the SBI main branch, but Angadi said this is not possible now as it would require changes in the plan and approval from the centre again and also there are monetary constraints. Entry to the RoB be from the SBI main branch would be great, it would provide a bigger solution to the traffic.